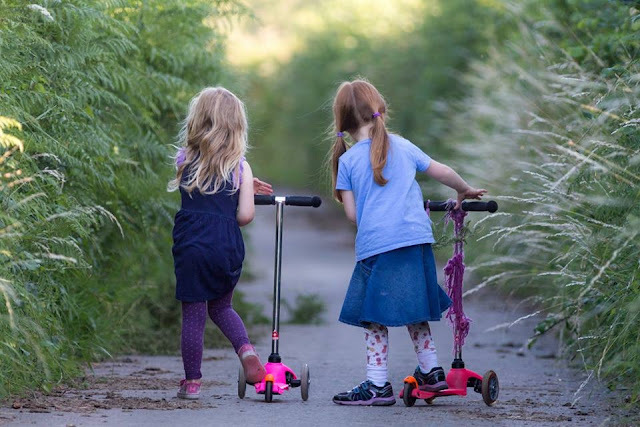 This week I am cheating a little bit in that I didn’t actually take this photo, but my friend Jeanette, a passionate bird and nature photographer, who managed to capture this shot of our girls during a little summer evening outing. I just love this picture. It signifies so much to me – summer, friendship and a carefree childhood; it just makes me happy. And carefree our girls were indeed, they managed to completely forget that they are meant to stay close-by and raced off on their scooters, almost out of sight. Good job Jeanette had her birding lens on her and managed to zoom in on our speedy girls.